Farm grown red hot chili peppers freshly picked and processed on the Pacific Island of Rota. This Pacific Red Hot Pepper mix was perfected for extended shelf life. These tiny yet really hot peppers are ground into a paste and mixed with salt, garlic and a pinch of preservatives, but is MSG free. 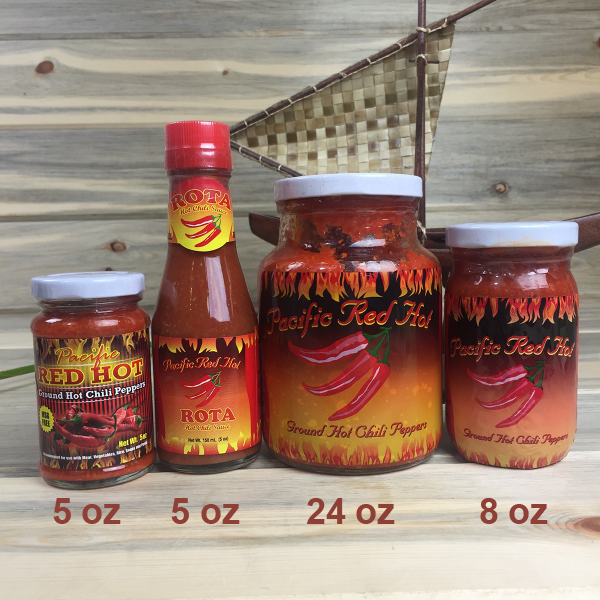 Great for spicing up meat, fish, soups and other spicy dishes, including hot dipping sauces. Uses: Great straight out of the bottle for any and all savory entrees, side dishes, and appetizers. Here is how the sizes stack up.